Added on December 4, 2018 by Dave Pressler. The hardcover book is available in the webstore! This volume was produced by the Lancaster Museum Of Art And History as a companion for my exhibition. Tony Pinto put this together, 100’s of photos this is the best showcase for my 21+ years of being an artist. Order yours today! Also perfect for holiday gifts! LIMITED EDITION! 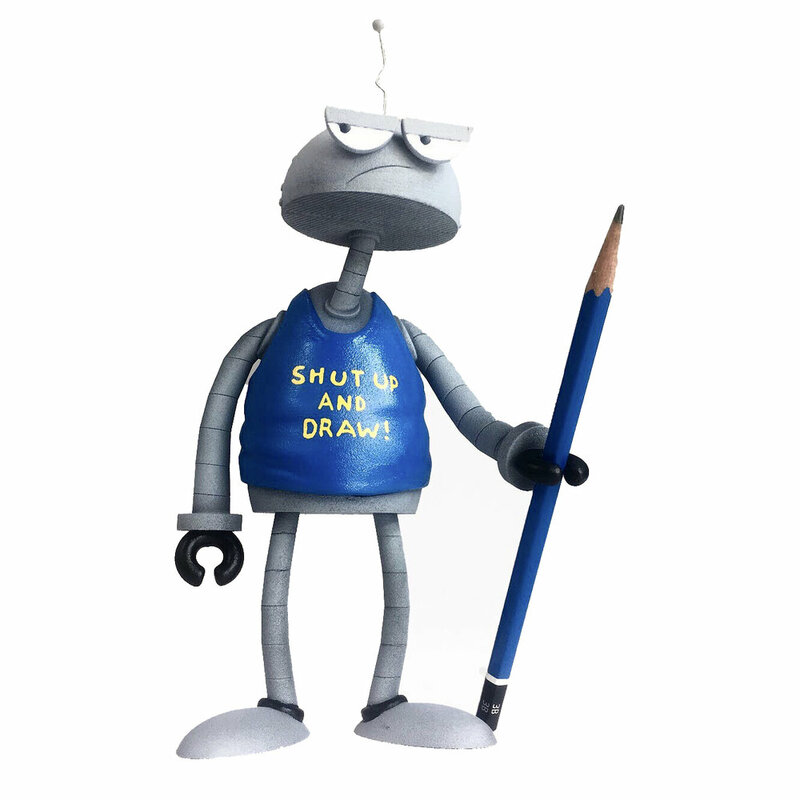 "Shut Up and Draw" Robots Available! Added on July 13, 2018 by Dave Pressler. I've been hard at work at Pretty in Plastic, building robots and prepping for my upcoming show at Lancaster’s Museum of Art History (MOAH), where I will be exhibiting a full retrospective of my 20+ year career – oh how time flies! When it comes to being an artist, what is it that separates the doers from the dreamers? The do-ers "Shut Up And Draw!" 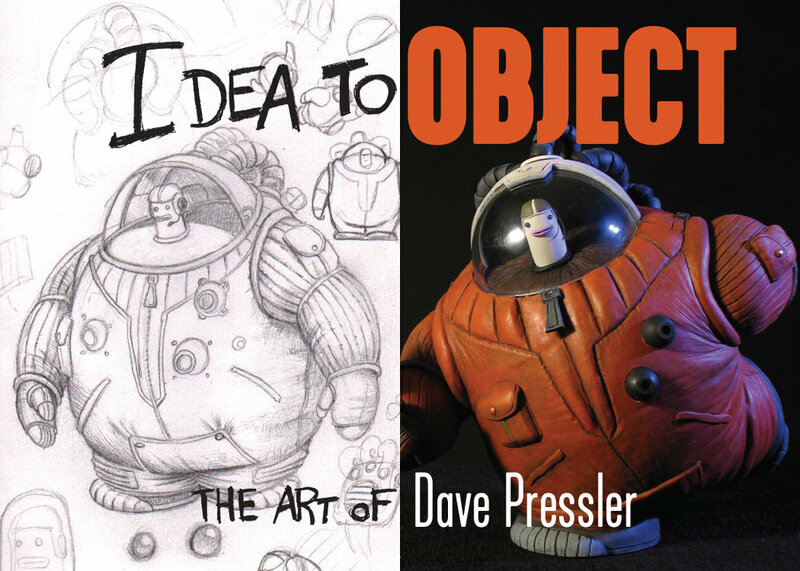 Based on one of my robot designs and best selling enamel pin, as well as the life-size robot sculpture that will premiere at "Idea to Object," my career retrospective exhibition at Museum of Art History Lancaster! 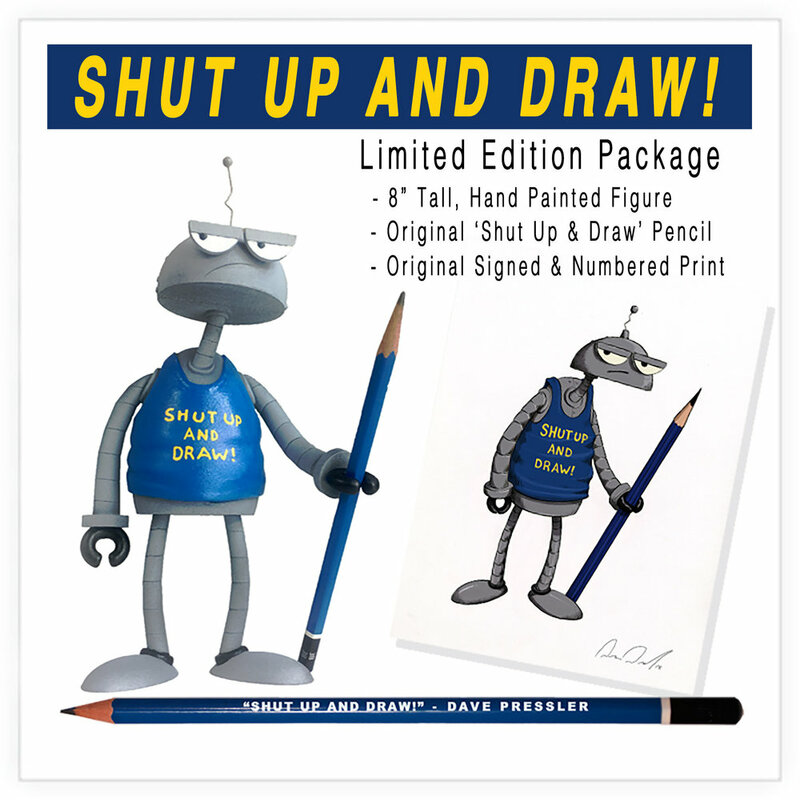 A must-have item for any art robot collector, each of the 50 limited-edition pieces will come with a signed certificate of authenticity as well as an 8" x 10" giclee print from Static Medium, and a custom pencil. 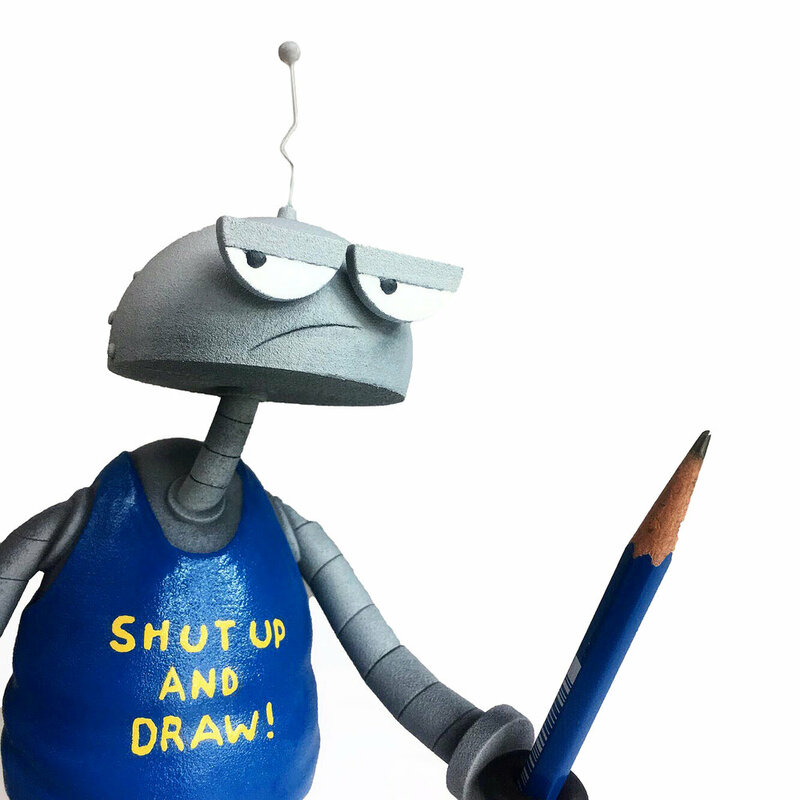 This item is sure to sell out fast, so don't procrastinate — "ShutUp And Draw!" Sculpted by the world-renowned sculptor Phil Ramirez. All figures purchased during the pre-sale will be available for pick up during the opening reception Saturday, August 4, 2018 from 2pm – 6pm, or ready for shipment in two weeks!!! Added on June 8, 2018 by Dave Pressler. "How did someone make that?" I want to de-mystify the creative process and demonstrate to people that art is just doing the work to take the ideas in your head and bring them into the physical world. MORE ROBOT PINS HAVE ARRIVED! Added on October 25, 2017 by Dave Pressler. 10 more Robot Pins are available, they just arrived from Telluride HQ Gallery, in the webstore now! Added on July 13, 2017 by Dave Pressler. "Back to School With Bigfoot" is on sale now, and on August 12, I'm teaming up with authors Samantha Berger and Martha Brockenbrough for a book signing at the flagship Barnes & Noble store at The Grove. I hope you can join us! Added on August 10, 2016 by Dave Pressler. Thanks to all who attended the opening of High Altitude Robots at soul & matter gallery. At the first week of Sept I will be back in Telluride to close the show, it will be up all month so go check it out! TELLURIDE ART SHOW - HIGH ALTITUDE ROBOTS! Added on July 12, 2016 by Dave Pressler. If you will be in Telluride Colorado August 4th come to the opening of my new gallery show High Altitude Robots at soul & matter gallery 135 West Pacific. The show will be up for the month of August with a closing reception at the end of the month. Looking forward to seeing you all in the high altitude. Added on January 20, 2016 by Dave Pressler. Welcome to 2016! Many exciting things going on for this year. If you live in Colorado I will be having a Gallery show in Telluride opening August 3rd at Gallery 81435 and November in New Mexico at the Stranger Factory. Currently I'm working on a book Illustration project, challenging and exciting, more details as we get closer to the release of the book. More to come! Added on November 19, 2015 by Dave Pressler. THE ASTRO SLOTH IS IN THE SHOP! Added on July 20, 2015 by Dave Pressler. After a successful debut at the MOAH show in Lancaster CA the Astro Sloth is ready for purchase in the website shop. This is a limited edition of 20 so don't wait. Added on July 13, 2015 by Dave Pressler. This weekend the opening of "The Art Of Toys" A Left Coast Retrospective Of Designer Toys at the Museum Of Art And History in Lancaster CA. Friday and Saturday I will be there with many other cool artist to meet and greet. Not only will they have an amazing exhibit of art toys past and present but also the process involved in turning an idea into an actual toy. One of my favorite quotes by Charles Eames: "Toys are not really as innocent as they look. Toys and games are the preludes to serious ideas." ASTRO SLOTH RESINS AND MUSEUM SHOW! Added on July 6, 2015 by Dave Pressler. Latest news, the Astro Sloth limited edition resins will be available Monday July 20th in the website shop as well as the store at MOAH Museum Of Art History in Lancaster CA starting on Sat July 18th. These hand painted signed and numbered figures are 8.5" inches tall 5.5" Wide. A nice 2 pounds of solid resin. A handsome figure ready for a desk or toy collection commemorating the achievements of the brave pioneer Astro Sloth. Retail price will be $450. The Play Create Collect Retrospective of West Coast Art Toys will be an amazing infusion of the Artist, designers, producers, and sculptors that created the West Coast Art Toy Movement. I will be in attendance on the 17th and 18th with many other amazing artist. Get more info on the show here. ASTRO SLOTH LIMITED EDITION RESIN FIGURE! Added on March 26, 2015 by Dave Pressler. Added on March 6, 2015 by Dave Pressler. Tonight I feel like the King Of The Nerds in the best way. Episode 7 was the big give away of my robot sculpture "Early Version Of A Modern Vacuum Cleaner" an original sculpture I will post a mini tutorial of the making of that sculpture on my blog Dave Pressler making stuff were I provide tips and tricks for some of the art that I create. Also KOTN has featured my sculpture Revenge-Bot in the Nerdvana Lounge this season. Love the show, and of course Host Curtis Armstrong who was the lead in my Nickelodeon Animated show Robot And Monster, yes again with the robots! Added on March 2, 2015 by Dave Pressler. Added on February 19, 2015 by Dave Pressler. A new episode of "How To Do Everything With Garrick And Marvin" is up. There will be a total of seven of my Robot shorts up on DreamWorks TV eight if you count the banned Halloween episode. If you haven't seen them yet Garrick and Marvin are two not very bright robots who have put quite a bit of energy into making DIY "How To" videos. That are always spectacular failures. These are stop motion animated shorts that I make in my home studio, very fun and always stupid. Added on February 4, 2015 by Dave Pressler. Eric Minh Swenson shot a 3 part short documentary series about my art and how I do some of the stuff I do. Check them out on YouTube The first in the series is "Blue Collar Artist". My philosophy about the working artist in the entertainment industry, and how one can approach the life of the working artist. KING OF THE NERDS! TONIGHT! Added on January 23, 2015 by Dave Pressler. Revenge-Bot will be making an appearance on the new season of King Of The Nerds the hit reality game show on TBS. Nerdvana is the home of the contestants for the duration of the show. In the rec-room Revenge-Bot is prominently displayed. If you have not seen this sculpture it is one of my biggest to date, it may be the last-biggest (If thats a proper phrase) since it has been quite the chore to lug him around. Also later in the season one of my original robot sculptures is a prize on the show. Stay tuned! Added on August 6, 2014 by Dave Pressler. My first gallery show in Colorado will open tomorrow Thursday Aug 7th from 5pm to 8pm. Added on April 30, 2014 by Dave Pressler. I know I said there would be T-Shirts in a week, what was I thinking! I do have T-Shirts Just need to get them in that store! This Saturday May 3rd I will be participating in Eat Your Art Out LA an art show that benefits the Angel City Derby Girls. There will be a new piece of art from me up for auction in the show, more info here. This Aug I will be coming to Telluride Colorado with an art show, details coming soon. And yes I will get there T-Shirts up there soon!